Directions: Preheat oven to 325°F. Mix peanut butter, sugar & egg until blended. Roll peanut butter mixture into 18 balls. Place, 2 inches apart, on baking sheet. Flatten balls in criss-cross pattern, with fork. Bake 18 to 20 min. Cool 5 min. Dip end of cookies into chocolate. 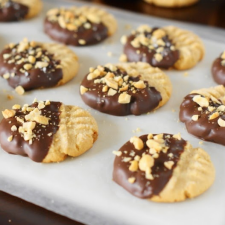 Place cookies on parchment baking sheet.